Sitting down to write this letter, I first asked esteemed colleague Evan Woodbery if a goodbye letter, given the brevity of my stay – 23 months in East Tennessee; 14 here in Knoxville – would be, perhaps, a tad self-important. Woodbery, as he’s won’t to do, offered clear-eyed perspective. He, being a whole three years older than me, is weathered and wise. Having spent the last week-plus looking back on the bizarre series of events that took me from A to B to Z, back to C, then to R and G and finally to Tennessee, I felt compelled to thank you — you, whoever you are, who is reading this. Because if you’re reading this, you either know me or worked with me or read my ramblings or followed me on social media — and whichever one you are, you helped me find my footing. To keep this particular ramble at a reasonable length, trust that the 10-count on my career had reached nine when, in August 2011, I decided to take a flier on a job at a startup website in Chattanooga. At age 28, I had been freelancing for almost three years, eating letdown after letdown from newspapers all over the country — always declining, but never hitting rock-bottom. Rent was paid from my cash tips, despite my status as the worst bartender in Philadelphia. Nine months later I left Chattanooga and accepted the men’s basketball beat writer job at the Knoxville News Sentinel. Fourteen months after that, I accepted the Michigan men’s basketball beat writer job at MLive. So now I’m off to Ann Arbor; a bittersweet departure. My time in both Chattanooga and Knoxville was wonderful, both personally and professionally. And regardless of what happens moving forward, I’ll always remember and be thankful for East Tennessee paving the pivot point I spent most of my twenties looking for. East Tennessee became a home I never anticipated. Despite y’all belittling my accent, my clothes and my disposition, I loved this place — Knoxville in particular. I won’t go one-by-one naming everyone who made my time at the News Sentinel as special as it was. You know you who you are, and if you don’t, I will likely tell you over a beer before I leave. Except for John Adams. John, you did little for me, and, in fact, probably served as a detriment. Woodbery, too, for that matter. Actually, all of you, except Mike Strange. To the readers (Vol fans), thanks for the interaction, the feedback and the passion with which you demand quality coverage. You may or may not agree, but I believe I became a better beat writer by working to meet your expectations. I would describe the Tennessee fan base, for the most part, as having a “leveled insanity” seen few other places in America. That’s a compliment. To Cuonzo Martin and the Tennessee basketball program, thanks for two seasons of admirable access and always being willing to work with me. We butted heads a few times, but the good far, far outweighed the bad. Best of luck in 2013-14. That’s all. Thanks for the memories, Knoxville. I love yous. This entry was posted in Uncategorized on September 27, 2013 by Brendan Quinn. Too dramatic? Over wrought with hyperbole? Way, way over the top? And because of all that, Tennessee’s new video feature staring Jeronne Maymon is solid gold. The first in a series of mini music videos aimed at churning the UT fanbase’s preseason excitement, the above Maymon video is not your average production from a university sports information department or public relations wing. It includes the following: Maymon posing with a 7-foot Red Tail Sun Glow Boa Constrictor, Gus Manning reading a revised version of Johnny Cash’s spoken-word piece “Mean As Hell” and dramatic footage from the boiler room of Thompson-Boling Arena. Added together, the video has the emotional nuance of a gong shot. But how did this all to come to be? UT sports information director Tom Satkowiak (@TomSatkowiak) said Tuesday he wanted to create a series of these videos that include “an aspect of each guy’s personality.” Not surprisingly, the debut video, which dropped Monday and now has over 3,300 views, addressed Maymon’s year-long rehabilitation from a litany of knee problems. Back when the video was just a brainstorm, Satkowiak mentioned to former Vol Sylar McBee that he was looking for a talented film student to work with. McBee mentioned a classmate, Conner Harville (@ConHarv), and connected the two. Harville is a Knoxville native from Bearden and a UT senior studying film. Satkowiak broke it to Harville that he couldn’t offer any money, but said Harville could include his name on the video as director and make a valuable addition to his portfolio. The pitch worked. Harville jumped onboard. The two got to work, along with UT graduate assistant Nate Bain. Next came the issue of how to secure a giant snake. Satkowiak wanted to include a live serpent in the video to conceptualize Maymon’s injury and struggle. He took his search to Twitter and after a few dominoes dropped, he was contacted by WBIR’s Kris Budden (now of Fox Sports fame), who recounted doing a story on odd pets. She told Satkowiak that Kyle Sanders, the boyfriend of Lady Vol softball star Madison Shipman, owns two huge boa constrictors. Of the two boas – one named SoCo, the other named Lime (COLLEGE!) – SoCo was selected because of an edge in length. Maymon, ever-imposing at 6-foot-8, 260 pounds, was not keen about a boa slithering along his shoulders (pssh, it’s non-poinonous). He was scared, as any normal person would be. Satkowiak, playing the role of Paul Serone, was in charge of keeping the snake away from Maymon’s face. Everyone survived the film shoot. Needing a narrator with penetrating pipes, Satkowiak then called on Gus Manning. As one would expect, the legend killed it. So with Manning narrating, clips of Maymon playing and Cash’s “Ain’t No Grave,” the film’s leitmotif, dipping in and out, Harville delivers quiet the video montage. Then comes some quick highlights of Maymon pre-knee injury and him flexing in the Thompson-Boling Arena boiler room. All the while, Kanye West’s “Black Skinhead” thumps in the background. The video concludes with three words: HE … IS … BACK. Postscript: Satkowiak said UT fans can expect the next video sometime around Sept. 15. Asked which player will be featured, he said, “I can’t spoil that.” I’m thinking Jarnell Stokes arm-wrestling a polar bear or Jordan McRae using a wasp nest as a speed bag. This entry was posted in Uncategorized on September 3, 2013 by Brendan Quinn. News of White Station (Tenn.) High School power forward Leron Black’s commitment to Illinois on Saturday morning wasn’t exactly a surprise, but that didn’t lessen the sting for Tennessee. The Vols had Black slated for a Sept. 28 official visit to Knoxville. A UT home football game against South Alabama was on the docket. That’s all changed. Black, having visited Illinois this weekend, committed to Illini coach John Groce on Sunday morning, thus cancelling his trip to Knoxville and additional scheduled official visits to Baylor and Indiana. Now all orange eyes are trained on five-star Milwaukee, Wis., forward Kevon Looney. The KNS confirmed on Sunday that Looney has an official visit scheduled to Knoxville on the weekend of Sept. 21 – a non-football weekend for Tennessee. Even with the scheduled visit, the Vols are still considered a long shot to land Looney. He’s long been considered a heavy lean to Duke, where he’ll visit next weekend, and he’s also considering Michigan State, UCLA, Wisconsin and Florida, where he visited this weekend. Looney is ranked as 2014′s No. 11 overall recruit in the 247Composite, which equally weighs prospect rankings and ratings from major recruiting media outlets. He is ranked as the No. 3 small forward in the nation. UT currently holds four 2014 verbal commitments. The most recent came on Aug. 18 from Madison, Ga., power forward CJ Turman, who is ranked No. 147 overall in the 247Composite ranking. He joined point guard Larry Austin (No. 100), shooting guard Jordan Cornish (130) and power forward Philip Cofer (134) as top-150 players pledged to Tennessee. All four are rated as four-star prospects by ESPN. This entry was posted in Uncategorized on September 1, 2013 by Brendan Quinn. No follow-up questions were necessary. Pancratz ran away with the conversation. He lamented over his lack of progress in the coaching profession. He recounted the malaise he felt walking into Cuonzo Martin’s office the day he quit. He talked about being scared of finding himself years down the line as a 35-year-old father of two working as a No. 3 assistant making nickels at an out-of-the-way, never-heard-of-it program. This isn’t how things were supposed to end. Pancratz arrived at UT as a graduate assistant in 2006, picking the right swell to ride just before the wave. He rode the Vols’ six NCAA tournament appearances from 2006 to 2011 and survived the crash when Bruce Pearl was washed out. Cuonzo Martin came to UT in March 2011 and retained Pancratz as the program’s video coordinator. Heading into Martin’s third year in Knoxville, that was still Pancratz’s title. This summer, he was passed over for the Vols’ director of basketball operations job and swung and missed on a few open assistant jobs. With that, Pancratz felt like he was climbing a ladder with no rungs. That, combined with a second child on the way, led him to resign, he says. He’s heading to pursue life outside of coaching’s grip. So why rehash this 24-hour-old news about in a blog? As the son of a Division I track and field coach and the brother of a Division I field hockey coach, I think Pancratz and those like him are fascinating. I find the realities of the coaching climb to be equal parts fascinating and sickening. I find the time dedicated by lowly assistants and staff members to be fascinating and disturbing. I was surprised by Pancratz’s decision. He and I are almost the same age. He’s turning 30 in a few weeks. I’m turning 31 in a few weeks. As a sports writer, I know the fear of a decomposing future. It’s easier for me to validate a blind run at a dream, though, because no wife, no kids and no mortgage make me a free agent in life. That’s where Pancratz and I diverge. All that said, I was still surprised to hear Pancratz explain his move. Coaching is a disease that gets past the façade and runs through the cracks. Trust that every graduate assistant in the country hired this summer heard the same from his elders: This is an ugly business. This job dominates your life. Are you sure you want to do this? Pancratz has the disease. So many young coaches do. In the early stages, a young coach thinks proving himself means logging absurd 15-, 16-, 17-hour days. The warped perception says it’s good to be the guy who sleeps on the ratty couch in the office. First-in, last-out is the expectation, not the exception. To be burnt out is a good thing. In reality, though, it’s nonsense, like a nation taxing itself into prosperity. Yes, other jobs are hard. Yes, plenty of other professionals work insane hours. But there’s something different about coaching. There’s something sadly all-consuming about it. Sure there’s the appeal of making millions as a head coach or six-figures as an assistant, but there are no guarantees. Sometimes the young coach simply turns into an old coach. When I was young, my father coached the track and field programs at Saint Joseph’s University, worked full time as a teacher and disciplinarian at Roman Catholic High School in downtown Philadelphia and worked summers as a park ranger at Independence Hall. I was the youngest of six and he was up against it. Dad could have certainly found another source of income less time consuming than being a college head coach. He’d never consider it, though. There are coaches and then there are those who coach. Dad doesn’t know how to be anything other than a coach. Even with a wife, six kids and three jobs, he spent every night making recruiting calls. He loaded up a cramped van with college kids every weekend and drove to New York or Virginia or god-knows-where. Dad is now in his 70s. Next year will be his 48th at St. Joe’s. It’s been a long disease. So I wonder what will become of Pancratz. Having watched him work for two years, I know he has the disease. It’s in the cracks. I’d imagine he already has more free time than he knows what to do with. What do you do when you’re done with all you know? He’ll have to figure that out. For now, he says he’s happy to have picked his family and what he hopes to be a more financially stable future. The young coach is no longer a coach, but don’t for a second think he’s beaten the disease. This entry was posted in Uncategorized on August 28, 2013 by Brendan Quinn. 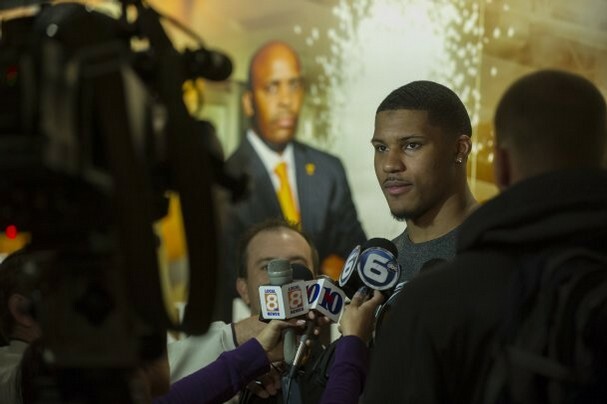 Cuonzo Martin recounted an offseason story Monday of former Tennessee great Allan Houston visiting campus and seeing Jarnell Stokes. 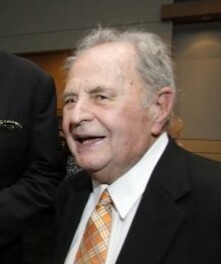 The former Tennessee great and current assistant general manager of the New York Knicks has met Stokes in the past. On this visit, though, Houston glanced past Stokes. According to Martin, Houston didn’t recognize the UT junior forward, which is hard to believe, given Stokes’ strong resemblance to an orange telephone booth. But Stokes does look slightly different, in that he himself is slighter. In a conversation with the News Sentinel on Saturday, Stokes said he’s down to 262 pounds and has trimmed off “weight I needed to lose.” A year ago at this time he was over 270. Martin specifically mentioned Stokes’ weight loss during a Monday press conference. Since entering UT as a 6-foot-8, 250-pound 17-year-old in December 2011, Stokes has packed on muscle and shed baby fat. Neither element drastically changed his ability to get up and down the court or the air. This recent change has paid dividends, though. Throughout last season, Stokes lamented endlessly about playing without injured frontcourt mate Jeronne Maymon and the impact on his game. Battling double-teams was clearly an adjustment, but paltry early season rebound totals from Stokes had little to do with Maymon. It was effort. It was body positioning. 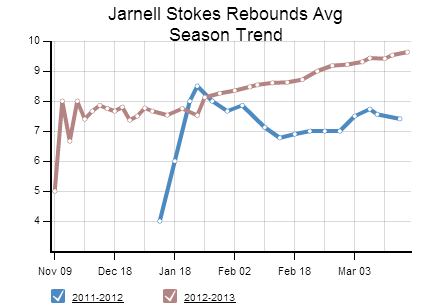 At 6-foot-8, 270 pounds, Stokes could grab five, six, seven rebounds per game merely by standing near the basket. Over the second half of the year, however, a noticeable shift occurred. 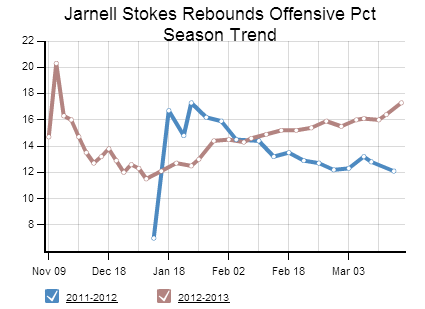 Stokes became a rebounder instead of a player who got rebounds. He threw around his weight. He battled, more consistently than ever, on the blocks. Results came. Note the direction of the above red lines. 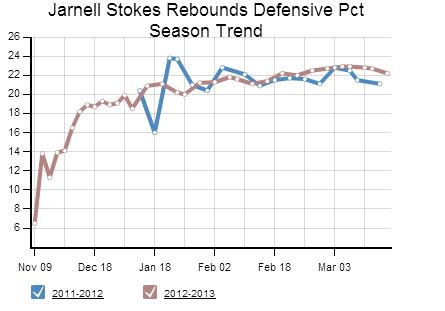 That’s Stokes’ season average in rebounds per games, offensive rebounding percentage and defensive rebounding percentage. The upward trajectory parallels only one thing – Stokes’ effort. Now Martin hopes the attitude seen over the’ second half of 2012-13 will combine with a more explosive frame and an offseason education stemming from an NBA draft flirtation. If it all comes together, Stokes will be one of the best rebounders in the country. Stokes says he gets it. He read the NBA scouting reports and talked to player personnel gurus. Anyone who has watched his season and a half in Knoxville likely knows what was said: Stokes needs to expand his offensive repertoire, move better defensively, rebound with some gusto and playing a little angry. Better free-throw shooting might help, too. Judging by everything heard on Saturday and Monday, some of the shortcomings have been addressed. Martin has said what the NBA scouts said. Martin, however, is not an NBA scout. At least some things have been recognized. This entry was posted in Uncategorized on August 26, 2013 by Brendan Quinn. While today is technically my day off (i.e. a chance to catch up on writing preseason team previews for Blue Ribbon), I wanted to share these recently posted scouting reports from NBA Draft Insider on Tennessee’s Jarnell Stokes and Jordan McRae. Take these for what they’re worth, but there’s some good insight provided on each player’s game. If you’re wondering what, exactly, NBA Draft Insider is, here’s a link to the site’s “About” page. This entry was posted in Uncategorized on August 23, 2013 by Brendan Quinn. 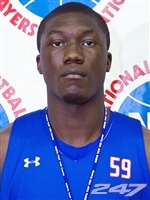 According to a Scout.com report, White Station (Tenn.) High School power forward Leron Black has scheduled the final four visits of recruitment. Black will be in Knoxville on Sept. 28, the weekend Tennessee football meets South Alabama at Neyland Stadium. That weekend will mark Black’s final official visit. He’ll be at Illinois on Aug. 31, Baylor on Sept. 7 and Indiana on Sept. 21. Some recruiting analysts believe Black is leaning toward Illinois. His visit to Champaign, Ill., will coincide with the Illini football team’s home game against Southern Illinois. Black is ranked as the No. 27 overall prospect in the 2014 class according to the 247Sports Composite. He’s rated as the No. 6 power forward in the country and the top recruit in the state. Black most recently trimmed Memphis and Florida off his list of possible destinations. This entry was posted in Uncategorized on August 20, 2013 by Brendan Quinn. I’ve received a few Kentucky-related questions from readers since today’s story on the 2013-14 Tennessee schedule was posted. A few folks asked if the second part of that statement was set in stone. Here’s why: The SEC scheduling rotation is in year two of an agreed upon three-year plan. Each conference team has a “permanent rival” that it plays home-and-home each year in the rotation. Tennessee’s rival is Vanderbilt. Now this is the important part when it regards Tennessee-Kentucky. All non-permanent rival teams play each other home and home one year, away only one year and home only one year. At the end of the three-year rotation schools will have played their rival six times (three home and three away) and everyone else four times (two home and two away). Tennessee and Kentucky played a home-and-home last year. This year the Vols only go to Lexington. Next year Kentucky will only play in Knoxville. Everything is up in the air following 2014-15. Tennessee coach Cuonzo Martin added a fourth commitment to his 2014 recruiting yesterday in the (rather large) form of CJ Turman, a 6-foot-9, 250-pound big man from Monroe County (Ga.) High School. Turman’s Sunday afternoon commitment (my News Sentinel story) came one day after he and teammate Tookie Brown, a 2015 point guard prospect, shared in an unofficial visit to UT. Turman, ranked No. 147 overall in the 247Composite ranking, joined point guard Larry Austin (No. 100), shooting guard Jordan Cornish (130) and power forward Philip Cofer (134) as top-150 players pledged to Tennessee. All four are rated as four-star prospects by ESPN. Sunday’s pickup was widely seen as a recruiting score for Martin & Co. The Vols’ frontcourt could be thin following the 2013-14 season, both in depth and the players themselves. Current senior Jeronne Maymon will be out of eligibility and junior Jarnell Stokes could be off in search of a professional career. If that occurs, Martin’s lone returning post men will be Rewane Ndiaye, a 6-8, 280-pound center with one year remaining at UT, A.J. Davis, who needs bulk and is more of a wing than a true frontcourt player, Derek Reese (see Davis description) and Quinton Chievous, who has seen time at power forward but is still just 6-6 and, like Reese, is listed on UT’s official roster as a guard. That’s why Turman and Cofer are crucial. Turman is big and mobile while Cofer is physical and athletic. I’m not smart enough to say whether either will be able to contribute in 2014-15, but UT needs bodies and that’s what Martin has gotten. And remember, the Vols are still in the mix for other impact forwards, including Kevon Looney and Leron Black. I’m expecting at least one more player to be added to Martin’s 2014 class. As for what others are saying about Turman’s verbal commitment to UT, here’s a sampling from the world wide web. Southern Stampede, the Nike Elite travel team Turman stars for, celebrated a big day. Turman wasn’t the team’s only SEC commitment on Sunday. Teammate Jakeenan Gant pledged a verbal to Missouri shortly before news broke of Turman’s commitment. Jamie Shaw, the director of recruiting for Phenom Hoop Report, had this to say about UT’s future frontcourt duo of Turman and Cofer. CJ Turman & Phil Cofer will fit in great w what Cuanzo Martin is doing at Tenn Physical & put a premium on defense & dirty work. Great gets! CJ Turman (Morgan Co. HS) and Phil Cofer aren’t the biggest guys but UT just got more physical in the lane. They’ll pop you. Telep’s ESPN teammate, Reggie Rankin, a former DI coach and current recruiting analyst for ESPN, has touted Turman in the past and kept it up Sunday. Just spoke with CJ Turman he is headed to Tennessee! Cuonzo Martin has a powerful rim protector in the fold! Great system fit as well. Looking at the various recruiting sites, meanwhile, On The Radar Hoops calls Turman, “A man child around the basket” and “an anchor in the paint.” Justin Young, the former national basketball recruiting editor of Rivals.com and current managing editor of HoopSeen.com, described Turman as a “cut-from-granite big man.” Additionally, Nooga.com offers this overview of Turman’s commitment. Finally, here is 247’s updated look at Tennessee’s current four-man class. This entry was posted in Uncategorized on August 19, 2013 by Brendan Quinn. Speaking with Tennessee senior Dontavis Sapp at Thursday’s Tennessee football media day, he dropped a helluva quote that I couldn’t manage to fit into this story for today’s New Sentinel. In discussing players’ perceptions of new coach Butch Jones, Sapp told me most of the Vols believed Jones exaggerated his relationship with Miami Heat head coach Erik Spoelstra. Spoelstra, of course, showed up on campus on Wednesday, visiting with the team and attending two practice sessions. This entry was posted in Uncategorized on August 16, 2013 by Brendan Quinn. 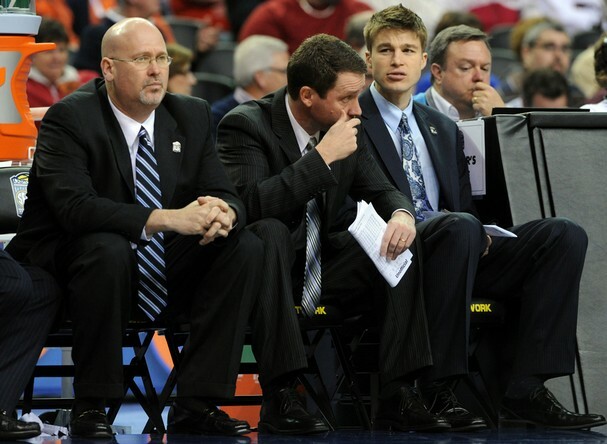 Brendan Quinn writes about men's basketball.